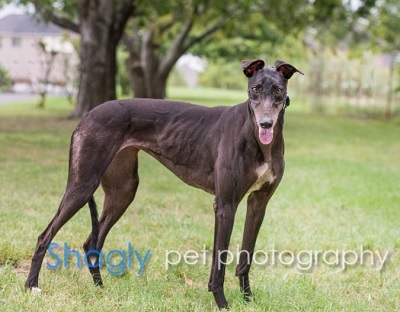 Joanie Depp, aka TC Pirates, is a 2 year old black female born June 22,2015. Her sire is Djays Octane and her dam is Atascocita Capri. Joanie has 12 races to her credit on greyhound-data.com, starting at Valley Race Park in Harlingen, Texas in December of 2016 and finishing at Mobile Greyhound Park in AL on August 14, 2017. Joanie is ready to meet her special someone(s) and enjoy her retirement. Joanie is not considered to be cat or small animal tolerant. Joanie Depp, just known as Joanie in our house, has been a joy to foster. We’ve had two greyhounds of our own over the years, but this was our first time to foster and we’ve really enjoyed having her in our home. She gets along great with our greyhound, they wake up in the morning and give each other kisses, snuggle during the day and race around the backyard together in the evening. The best thing about Joanie are the funny noises (sighs/moans/grunts) she makes throughout the day, they’ll keep you entertained. She has beautiful eyes, adorable ears and a super shiny coat. Joanie is an early riser, she is usually up before 7am and immediately needs to go out to the bathroom. At other times, she will warn you when she needs to go to the bathroom by pacing or whimpering, and she definitely needs to go out at least once during the day – 5 hours is the longest she has gone without having an accident in the house. Joanie loves scratches and belly rubs, and she’ll give you a few licks after as a thank you. Joanie has a great appetite, she never turns down food, but sometimes turns her nose up at treats. Joanie doesn’t love “stuffies” as much as other greyhounds, she will usually play with one briefly and then becomes disinterested. There have been a few times though where she fixates on one and squeaks it over and over, so she may just need more time to figure out how fun toys are! Joanie enjoys going on walks and for a ride in the car, really any time she gets to leave the house she is super excited. We’ve been through several thunderstorms with Joanie and she’s slept right through them. She doesn’t seem scared of anything, she’s very friendly and loves to be in the same room with her people. She recently started cuddling with her people and LOVES to give kisses. When Joanie gets excited she jumps up and has a pretty forceful push, so we are working with her on this. Usually if you just turn away from her she won’t jump. 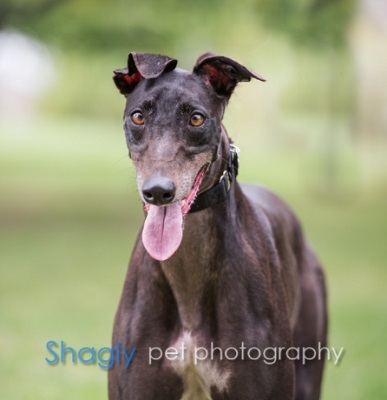 We feel Joanie would thrive in a home with a family, another dog and a big backyard. Joanie is not cat tolerant.